While Arizona is well known for the spectacular Grand Canyon, there’s another natural phenomena that attracts visitors from around the world to the northern Arizona desert. Meteor Crater is the best-preserved meteorite impact site on Earth. The result of the collision between an asteroid and Earth approximately 50,000 years ago, Meteor Crater is nearly one mile across, 2.4 miles in circumference and more than 550 feet deep. 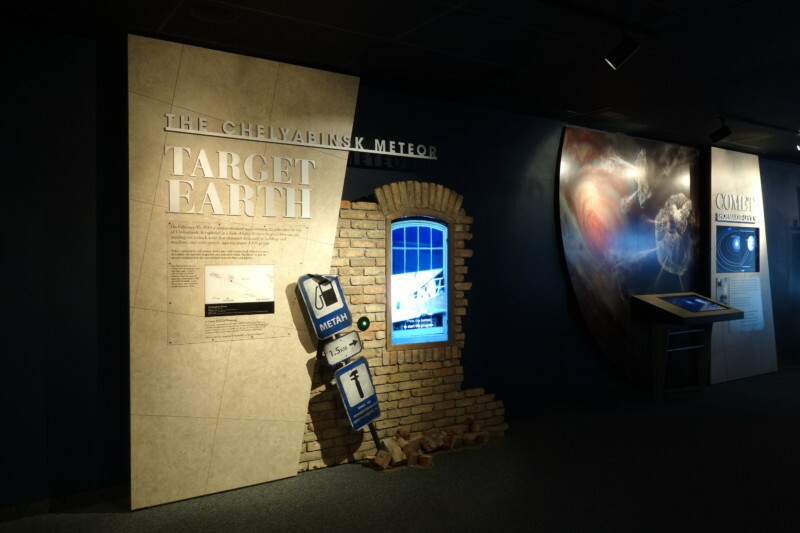 The Meteor Crater Interactive Discovery Center prepares visitors for their look at the adjacent impact site with 24 interactive displays and exhibits detailing the origins of meteors and their encounters with the Earth. Recently, Portland, Oregon-based Formations, updated the underlying hardware that delivers the AV content and enhanced some exhibits with new videos and upgraded presentations. The company also devised the original exhibits about 15 years ago. For example, a new video from Formations ranks the density of the Center’s gleaming meteorite specimen compared to a car, motorcycle and horse. Visitors try their hand at guessing the order of weight by manipulating a row of rotating pictorial cubes then the video reveals the correct – and surprising – results. Formations also created “Crater Perspectives,” an exhibit featuring artifacts housed in wall-mounted cases and portrait busts of famous scientists which is displayed on a 55-inch LCD. A dynamic new experience helps each visitor to “Put Yourself at Ground Zero” when the meteorite impacted the site. Formations outfitted a hexagonal chamber with a 55-inch LCD, flashing RGB light effects, a sound track complete with sonic boom, and a hot air burst that help them imagine what happened 50,000 years ago. Additionally, a video-enabled microscope in “The Lab” allows visitors to examine three rock specimens formed by the impact and view them close up on monitors. New touchscreens and monitors frame a large world map in the last exhibit, “Impact Earth,” which shows 20 other impact sites across the globe. The Alcorn McBride V4Pro replaces an older show control system from another manufacturer that was “much more complicated” to operate, says Williams. The V4Pro powers exhibits and their monitors, touchscreens, as well as other interactive exhibit components. The V4Pro controls the changing light effects, starts the heater for the hot air burst and triggers the sudden warming of the chamber in “Put Yourself at Ground Zero” while the A/V Binloop HD plays back video content. Williams used the DMX Machine and DMX Ramps to make the lighting effects in WinScript. “The RGB lights just make the chamber feel more dynamic, and the color and intensity of the effects track the events in the video fairly well,” he reports. The V4Pro also provides DMX control of 20 points of pulsing lights on the world map in “Impact Earth” while the A/V Binloop HD plays back news and animations of the Chelyabinsk meteor impact. Alcorn McBride’s A/V Binloop HD also plays back the attract loop and main video program for “Crater Perspective.” The DMX Machine replaces the exhibit’s old lighting controller; DMX control of lighting levels brings up display case lights to highlight artifacts and illuminates the scientists’ busts. The Digital Audio Machine (AM4), controlled by the V4Pro, now plays a streaking comet sound on demand giving staff better control over the sound effect that had formerly been looped on a CD player.